For more details on this topic, see Basilica of San Lorenzo, Florence. Though it was vaulted over by 1524, the ambitious projects of its sculpture and the intervention of events, such as the temporary exile of the Medici (1527), the death of Giulio, now Pope Clement VII and the permanent departure of Michelangelo for Rome in 1534, meant that Michelangelo never finished it. 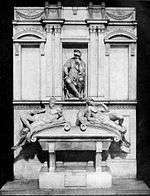 Though most of the statues had been carved by the time of Michelangelo's departure, they had not been put in place, being left in disarray across the chapel, and later installed by Niccolò Tribolo in 1545. By order of Cosimo I, Giorgio Vasari and Bartolomeo Ammannati finished the work by 1555. 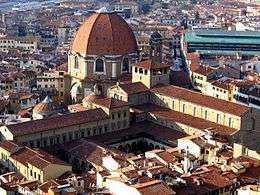 The lantern at the top of the Medici Chapel is made out of marble and has an “….unusual polyhedron mounted on the peak of the conical roof,”. The orb that is on top of the lantern has seventy-two facets and is about two feet in diameter. The orb and cross, that is on top of the orb, are traditional symbols of the Roman and Christian power, and recalls the similar orbs on central dome plan churches like St. Maria del Fiore and St. Peter’s. But because it is on a private mausoleum, the Medici family is promoting their own personal power with the orb and cross, laurel wreath and lion heads, which are all symbols of status and power. The lantern that holds up the orb helps to accentuate the height and size of the chapel, which is fairly small. The lantern is a bit less than seven meters tall and, “…is equal to the height of the dome it surmounts,”. The lantern metaphorically expresses the themes of death and resurrection. The lantern is where the soul could escape and go from “…death to the afterlife.”. ↑ Avery, Charles (1970). Florentine Renaissance Sculpture. John Murray Publishing. p. 190. ↑ In the separate, earlier crypt beneath the nave of the basilica itself are buried Cosimo de' Medici and Donatello. ↑ TCI, Firenze e dintorni 1964:286: "indeed, conceived according to the Baroque aim of arousing stupefaction" (concepita già secondo il fine barocco di destare stupore). 1 2 3 Wallace, William (1989). 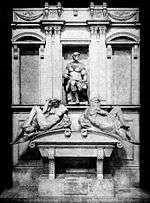 "The Lantern of Michelangelo's Medici Chapel". Mitteilungen des Kunsthistorischen Institutes in Florenz.